Ha ha ha...do you like what I did there?! 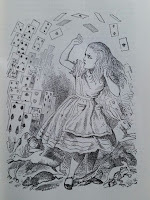 Alice in Wonderland, a well loved children's classic, and even more so for me, because the writer Lewis Carroll was born and lived in the village of Daresbury, Cheshire...about 5 miles from where I grew up. There's a church in Daresbury where the stained glass windows show Carroll's famous characters, and I can remember going around the church looking at them whilst my dad happily recited The Walrus and the Carpenter and Jabberwocky from memory to me! "what is the use of a book...without pictures or conversations?" Alice in Wonderland tells the story of a young Alice, who, bored at sitting on the river bank with her sister who is reading a book without pictures, begins wondering whether she is too sleepy to go and pick daisies when she sees a white rabbit run past her. 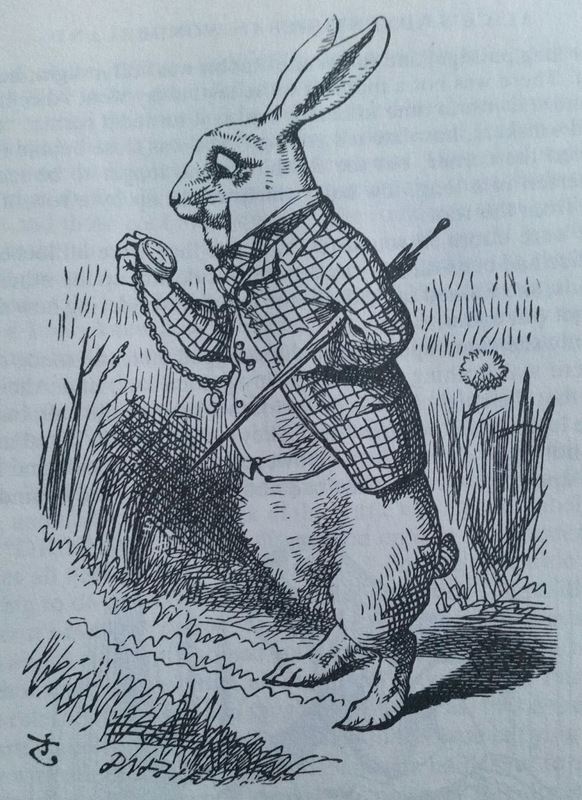 Nothing strange in that, unless you consider this white rabbit is wearing a waistcoat, and has a pocket watch, and can talk! 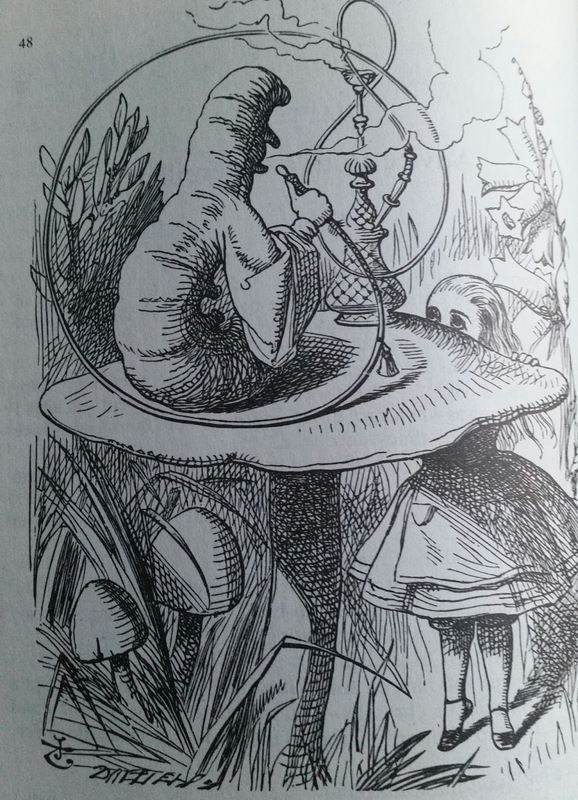 Now Alice, being of a rather nosey bent, decides to follow the rabbit and enters Wonderland after falling down a rabbit hole after him. What follows is a voyage into the unknown where we meet a myriad of the most fantastical characters in fiction. Whilst we are never going to come across a talking cat or caterpillar in real life, these characters symbolise some of the types of people we come across in everyday life. It is interesting to see how Alice copes and interacts with each of these different traits of human nature and how Carroll has managed to create a world where the real and unreal meet. One of the first characters she meets is a very laid back caterpillar. He is delightfully vague and contradictory and it makes for an interesting conversation with Alice, he is like a child, answering a question with a question. 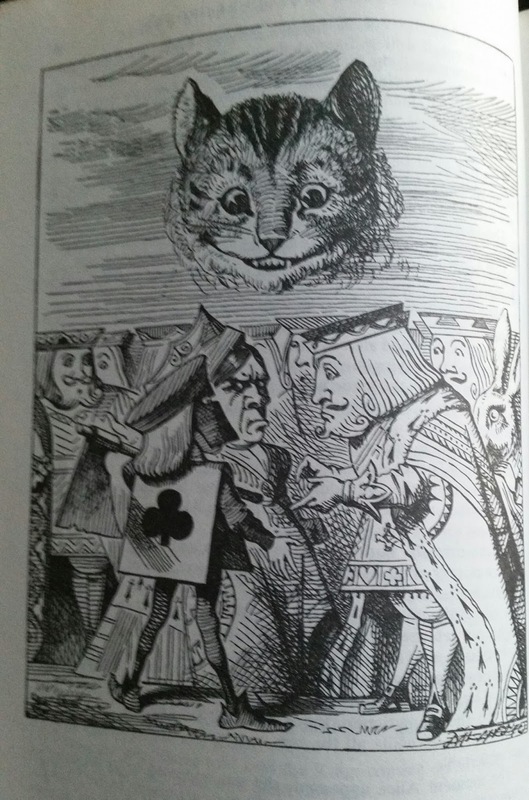 Fish and Frog footmen are equally confusing to poor Alice as she wends her way towards the Cheshire Cat. Now anyone who owns a cat, knows that really the cat owns them. They are intelligent creatures, and none more so than this cat who can disappear into thin air leaving his smile behind him. He has a sense of unerring logic! " you see a dog growls when it's angry, and wags its tail when it's pleased. Now I growl when I'm pleased, and wag my tail when I'm angry. Therefore I'm mad." You can't dispute logic like that! We all know someone who is a little unconventional! I had a conversation with Tom Burke once in which someone told him we were mad. I said I'd call it eccentric, he quite agreed and said he felt he was somewhat eccentric himself! I doubt even he could compare to the Mad Hatter and The March Hare though! These characters are so full of life, they have boundless energy and a huge sense of fun, but they're also rather rude and straight to the point with their personal remarks! I do however love the Mad Hatter, not least because he seems rather partial to tea just like me! As he says, "it's always tea-time", Oh how right he is! 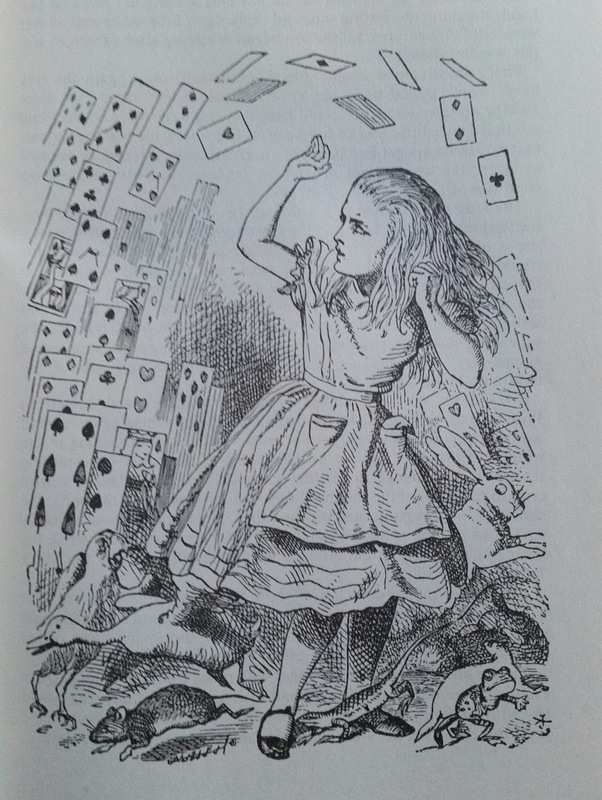 Not everyone in Wonderland is nice though and Alice soon gets to meet the despicable Queen of Hearts who after declaring Alice should have her head chopped off, relents and asks her to join in with a game of croquet. But this is Wonderland, so it can't be an ordinary game of croquet...no this game is played with flamingo's and hedgehogs rather than mallet and balls. 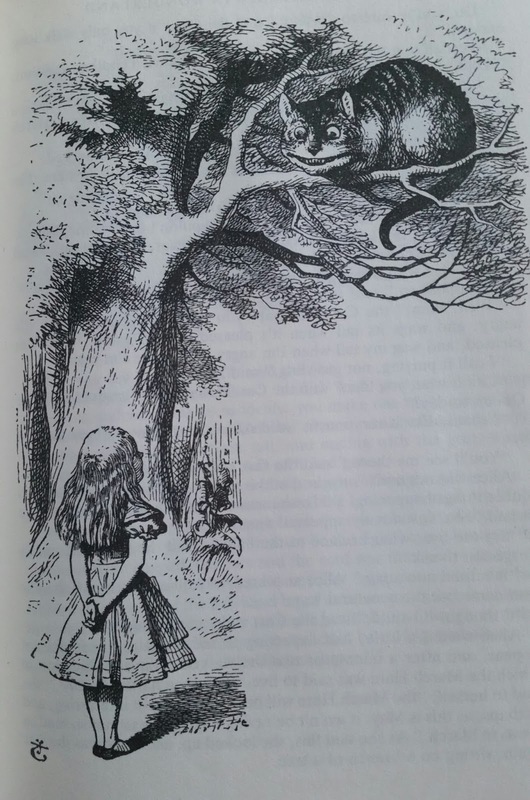 "We called him Tortoise because he taught us,"the poor Mock Turtle wailed at Alice as he told her his sorry tale as to how he went from a real turtle to a Mock Turtle, aided rather well by a Gryphon who thought Alice a rather stupid child. Alice finally awakens and recounts her imaginative tale to her sister, who rather than following her sister back into the house sits and ponders the tale she has just been told. She imagines her sister all grown up, with children of her own who she can recount this land of make believe to, and the joy they would get from the stories of the Wonderland folk. In reality, Alice's sister was right. Children year after year enjoy hearing the tales that Alice encountered, and even as an adult, it's sometimes nice to take a cup of tea into the garden, and spend an afternoon going back to Wonderland! Of course...if you haven't had enough of Alice's adventures, you can travel with her Through the Looking Glass to meet many more curious characters, the Walrus and the Carpenter; the Red and White Queen; Humpty Dumpty; and of course Tweedledum and Tweedledee! For details of the charity tea party see @burketeaparty on Twitter!